We are the No. 1 news provider in East Linn County. 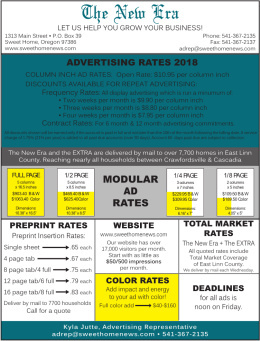 In addition to display advertising opportunities on this website, The New Era provides total-market-coverage print advertising for East Linn County. We distribute within the borders of the Sweet Home School District – to approximately 6,000 households with a population of some 15,000 people. Our newspaper circulation generally hovers around 1,500 per week, as many of our readers purchase their newspapers from local markets. In addition to The New Era, we also publish a monthly newspaper, The Lebanon Local, in Lebanon, 15 miles northwest of Sweet Home. For more information, we encourage you to contact us by phone at (541) 367-2135, in person at 1313 Main St. in Sweet Home, or by email at adrep@sweethomenews.com.